Not widely seen in Australia, Brunfelsia jamaicensis is one of the real stars of the genus. Long flowering and with a fragrance that will fill the garden on a warm evening, this is a plant that may well make a comeback with landscapers. The flowers are white and appear as tubular buds before opening to clusters of ruffled blooms on the end of the tubular stalks. Foliage is mid to deep green and fairly dense. Also known as Jamaican Lady of the Night, it is found in the mountains of Jamaica, it does grow at an elevation of around 1500 metres, and it will grow in cooler climates. It is the delicate fragrance that gives this plant its appeal and its name. The fragrance is milder in the daytime however really ramps up in intensity as evening comes around. If you can imagine a frangipani with a touch of citrus. 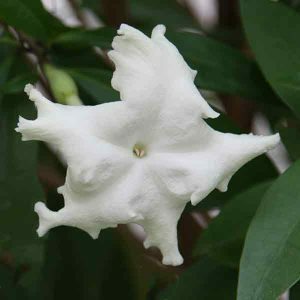 Unlike some related species, the flowers remain white rather than fading to cream. This is a plant that can flower a few times during the year, summer, autumn and sometimes in spring. Best grown in a position where it receives good light in the morning and protection from the hot afternoon sun. Prepare soil well before planting, dig in some well rotted compost and aged cow manure a few weeks before planting. Water in new plants with a liquid seaweed fertiliser. Mulch lightly to help maintain a cool moist root run. 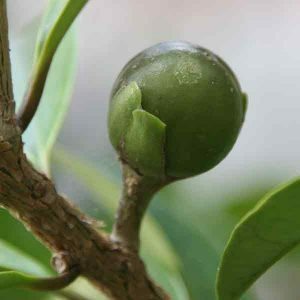 Once established, if grown in the right position, this is a very easy care plant and requires only occasional watering. Height – From 2- 3 metres in height, often on the smaller side. Spread – Upright growth habit with a spread of 1 – 2 metres. Position – A warm position, morning sun for 5 hours and then in dappled shade. Flowers – White and fragrant. Propagation is from cuttings, arial layering as well as from seeds collected fresh.